What is it? 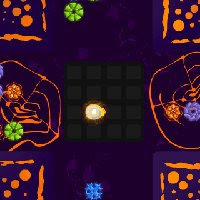 – Catalyst, an action/puzzle/shooter where you strategically (and then frantically) blast brightly-colored “molecules” that assault you from all directions. Who made it? – Federico Roberts of Intruder Games. How does it play? – You move the catalyst around with the arrow keys, and fire beams of energy to destroy like colored molecules. Shooting a molecule of a different color will cause the catalyst to absorb that new color. Shooting the rare molecules that appear will yield various effects, from removing an entire row of molecules, to stopping the appearance of new molecules for short time. In the end, the molecules come in faster and faster until you’re surrounded and die, and it’s got a very solid old-school arcade feel. Presentation – Very good, across the board. It’s got some colorful neon science-fictiony visuals, and music and sound effects that I didn’t once feel I needed to turn off. Positives – It feels like a multi-directional hybrid of the classics Space Invaders and Tetris. High-score junkies will eat this game up. The psychedelic backgrounds change after you level up a number of times, and keep the game from becoming visually boring. Negatives – None, really, unless it’s just not your sort of game. It pretty much accomplishes what it sets out to do, and does so very well. Why you should play it – If you’re old enough to remember paying a quarter per play for games like this in an arcade, or just want to experience an effective blend of retro gameplay types topped off with some shiny visuals, Catalyst a great way to kill some time.